The second West Cheshire Poverty Truth Commission (WCPTC) launched at Storyhouse on 31 January 2019, bringing together a new group of community inspirers with civic and business leaders to look at how poverty is tackled across the borough. 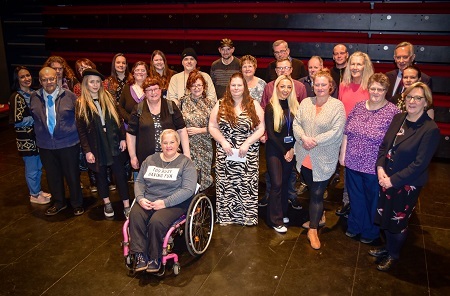 Community inspirers, who are residents with lived experience of poverty, shared their stories with over 150 people from many different sectors at the launch, and explained why they have decided to get involved with the second WCPTC. The commission creates a safe space for community inspirers to put their experiences of poverty across to civic and business leaders, providing an opportunity for those who can influence decisions to listen and think differently about how we can deal with poverty. A lot of progress was made during the first commission, which Cheshire West and Chester Council launched in February 2017. Community inspirers visited the House of Commons to speak to MPs about their thoughts on the welfare system, written evidence was sent to the Work and Pension Select Committee, and mental health awareness training was put in place for many Council frontline staff. Organisations across the borough are also encouraged to sign up to the WCPTC’s pledge, which asks for all customers to be treated openly, honestly and respectfully. The Department for Work and Pensions across Cheshire recently joined the pledge and will have a senior manager directly involved in the second WCPTC. Councillor Nicole Meardon, Cabinet Member for Families and Children at Cheshire West and Chester Council, said: “The first WCPTC was a big success and I’m looking forward to seeing how we can build on that in the second commission. “It was very inspiring to hear some of the stories from the new group of community inspirers, who are all dedicated to playing an important role in the second WCPTC. “Positive relationships have been developed with many local organisations through the first WCPTC and the new group will want to continue that, raising awareness of poverty and the challenges those who experience it come up against. Visit the Council’s website for more information about the WCPTC.